Replicants is a company which produces unpainted plastic toy figures in 1/32 scale. 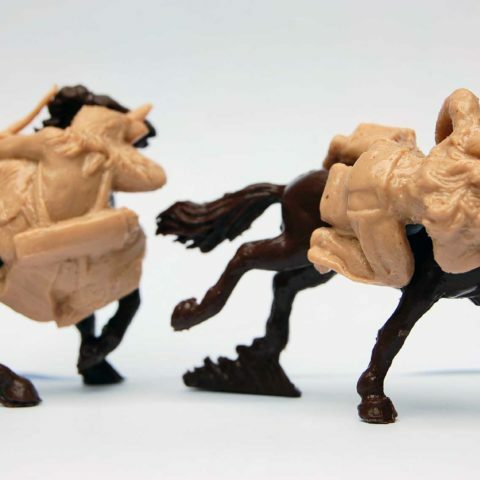 The company is based in the Sussex town of Lewes and is run by people with a passion for plastic toy figures. We try to make figures which are a little bit unusual. 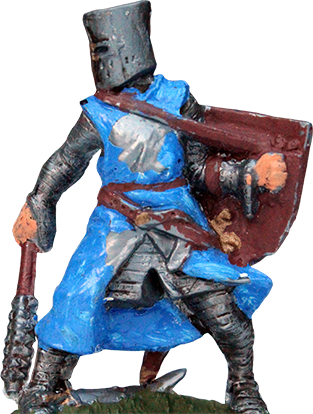 On this website you can get an idea of our range of figures, as well as learning a bit about how they are made and how they look when they are painted and/or converted. 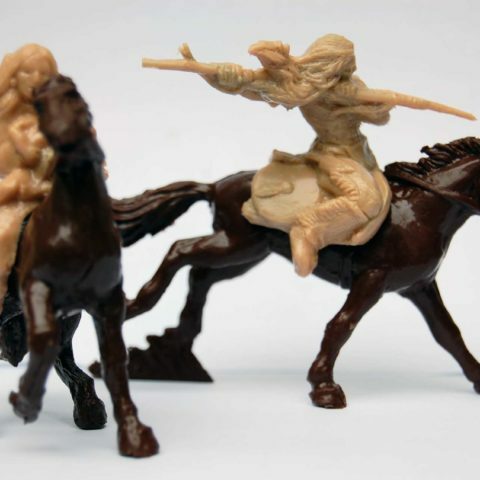 You can also learn about the spare parts we make for Britains figures; and just to make you cross we show the lovely figures which we used to produce but which we have now deleted because the moulds were proving troublesome. We hope this will spur you to buy from the current range while the figures are still available. And there is a section showing dioramas, most of which feature Replicants figures. 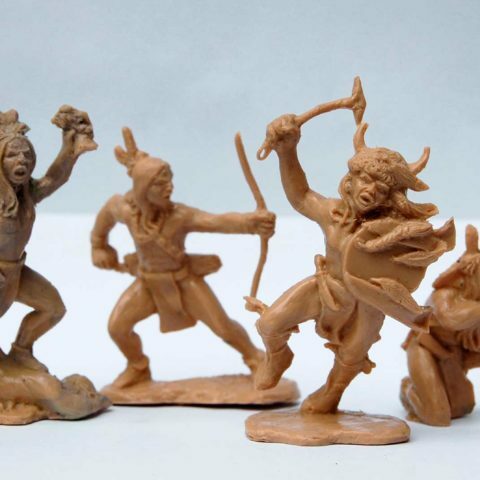 In the Catalogue section you will find sets of unpainted figures, which can only be purchased through our exclusive distributor Steve Weston’s Toy Soldiers. For further contact details please see the how to buy page. 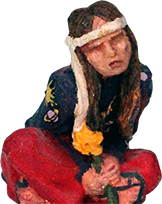 In the Lewes section you will find individual hand-painted figures and other items connected in some way to local Lewes history. Unlike the main Catalogue section, Lewes items can’t be bought through our distributor, they are only available from our workshop on Lewes High Street. The Replicants operation takes place in the basement of a jewellery shop. 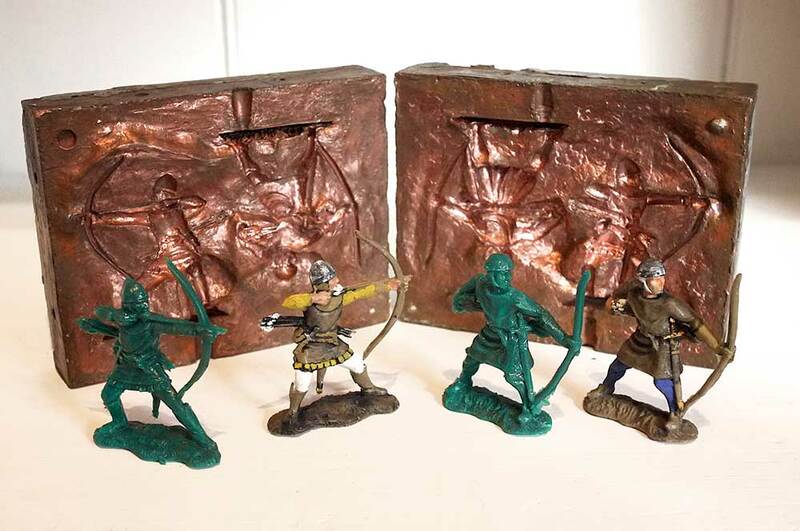 Visitors are welcome, but they should not come expecting a shop full of toy soldiers. The headquarters of Replicants is in the basement of a big jeweller’s shop (he’s about 6’4″) in Lewes, East Sussex. The shop is almost underneath Lewes Castle, which was built by the Normans in 1068; but Replicants’ basement is older still, dating back to around 800. However, Replicants itself isn’t quite that old: it was finally founded in 1996 by Peter Cole and Paul Morehead when they couldn’t wait any longer; and these two still run the company after a fashion. Peter comes from an old Lewes family. One impatient ancestor, Thomas Rickman (1776–1841), as a headstrong 18-year-old fed up with waiting for plastic to be invented, “drew and coloured 5,000 toy soldiers which he cut out and arranged in front of architectural backgrounds of military buildings.” However, nobody was very interested and the idea was shelved until polythene had been developed. 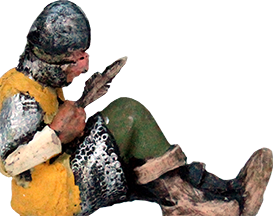 Even then Peter and Paul hesitated, reasoning that part of Thomas Rickman’s misjudgement was in starting his toy soldier venture at too young an age; so they delayed until well into middle age before they decided to make their move. The rest is history – as opposed to the fanciful ravings of two dotards – and so we will not bore you with it here. We intend to add to the list of spare parts as time allows, but making new figures will always be our priority. We make it a rule never to discuss or announce what we are planning to do next or in the future. Superstition. Talking about what you intend to do in the future is a sure way to make it go wrong. Aren’t we all fed up with manufacturers who advise what they intend to release months (even years) ahead, and then keep changing it when things don’t work out? With Replicants, you have to wait and see. 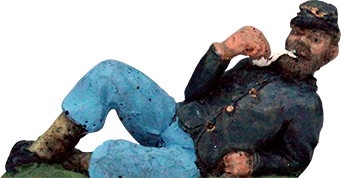 As well as designing and sculpting all Replicants’ figures, Peter Cole also writes on the history of plastic figures. He contributes numerous articles to Plastic Warrior magazine. Over the years Peter has designed and produced several anniversary figures for Plastic Warrior magazine’s significant birthdays. Peter also wrote the book Suspended Animation: An Unauthorised History of Herald and Britains Figures , which is sadly no longer in print, as well as co-writing the book, Herald Civilian Models: The Golden Years , with Barney Brown. 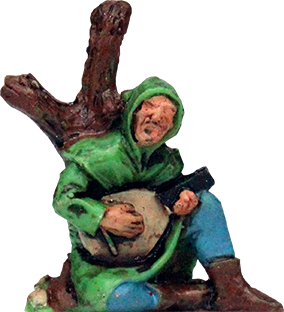 The company exists to produce limited production toy soldiers and figures in polythene in 54mm. Up to now the enormous tooling and production costs have prohibited small batches of figures being made in this material. New mould-making techniques and scaled-down production methods have now made it possible to economically produce batches of around 1,000 mouldings in polythene. This makes it an ideal proposition for the collectors’ market but sometimes means that figures may only be in production for a limited period of time. It must be something that is missing from the plastics market. 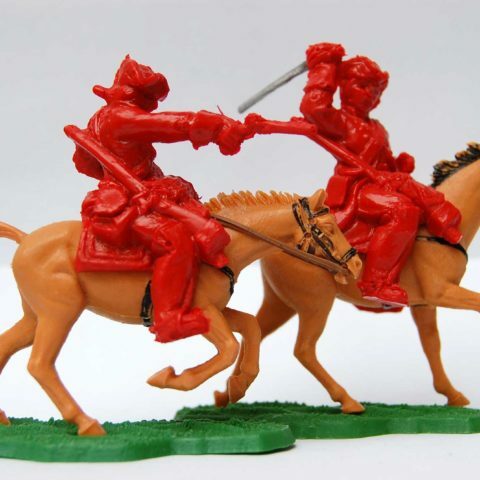 It might be a period that has never been done in plastic before (Nelson’s Navy); or a subject within a popular period (such as the ACW camp-fire figures) that is not available nor likely to be made by anyone else; or something (like the Sheriff’s men) that collectors have always asked for but other makers have largely ignored. We are inclined towards the simple unglamorous soldier on campaign rather than ceremonial uniforms or characters of dashing heroes. But most of all it must be something that appeals to us and captures our imaginations. When we started the company we drew up a list of all the possible subjects and we are working our way through it, and often add to it. We are always pleased to hear from collectors with their suggestions for additions to the list of figures we could do in the future. There are no guarantees, but we do like to hear your thoughts. The plastic which we use is up to 50% recycled. 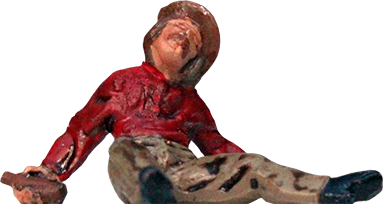 To recycle more than 50% would produce brittle figures. The concern about environmental impact which we all share in relation to plastic packaging does not apply to Replicants figures: who would think of throwing one away? They’re not. We work to a constant 1/32 scale, re-using armatures and weapons from previous releases. All the armatures are made to a consistent scale, as are the weapons. However, real people are not all the same size and we try to reflect this in the models we make. 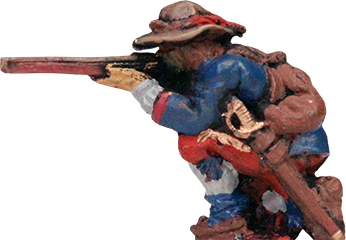 We have three figures in the current range armed with musketoons or blunderbusses; each time the very same weapon has been used but the three figures are very different sizes because the muscles can be made bigger or smaller and the height of a person can vary considerably within that 1/32 scale. When Replicants make a set of six figures they are six characters, not one man in six poses.